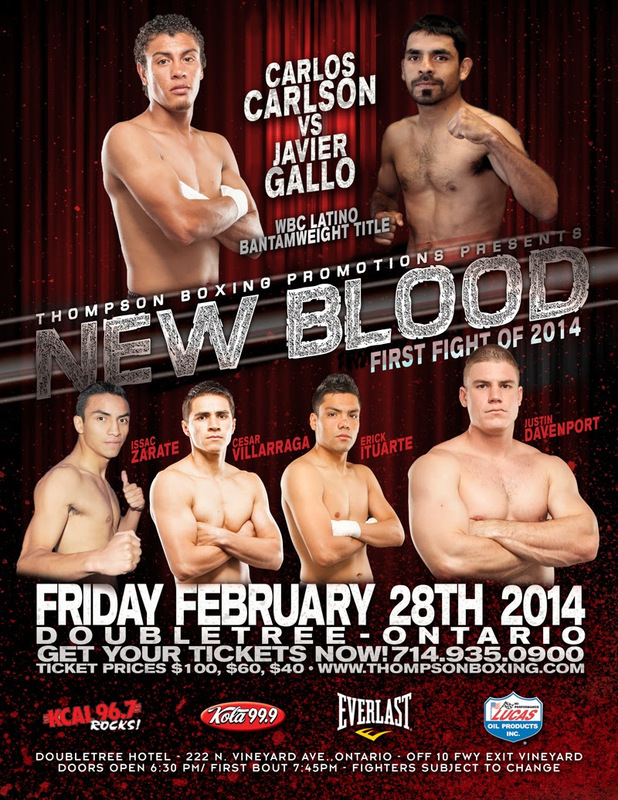 ORANGE, Calif. – Two weeks from today, Thompson Boxing Promotions begins its monthly Southern California boxing series with what can only be described as a clash of all-action fighters between undefeated knockout artist Carlos Carlson(12-0, 9 KOs) and the upset-minded Javier Gallo (21-8-1, 12 KOs). They will battle for the vacant WBC Latino Bantamweight Title Friday, Feb. 28, from the Doubletree Hotel in Ontario, Calif. Both fighters hail from Tijuana, Mex., which makes this eight-round main event even more intense as hometown bragging rights are at stake. Tickets priced $100, $60 and $40 are on sale now and can be purchased by calling (714) 935-0900 or online at ThompsonBoxing.com. Carlson is on a knockout spree having won his last seven fights by stoppage. Among his favorite punches is a left hook to the body that carries enough stopping power to flatten opponents. Gallo, a versatile bantamweight that accorded himself well against the strong and former world champion Vic Darchinyan, had won three straight before losing a technical decision against Felipe Orucuta in October. He moves well, throws punches from a variety of angles and has faced quality opposition. The co-feature showcases another pair of exciting bantamweights. Once-beaten Issac Zarate(6-1) of Los Angeles takes on Christian Torres (3-4) of Guadalajara, Mex. in a six-round fight. Zarate is not known for his punching prowess, but an active motor allows him to fight at a fast pace. Erick Ituarte (6-0-1, 1 KO), an undefeated featherweight prospect out of Santa Ana, Calif., puts his young skills to the test against an opponent to be named later. The fight is scheduled for four-rounds. Ituarte is one of a handful of fighters that signed a promotional deal with Thompson Boxing Promotions late last year. Justin Davenport (1-0-1, 1 KO), a heavyweight from Lake Arrowhead, Calif., goes for another knockout victory against the undefeated Edward Ramirez (1-0, 1 KO) of Yuma, Ariz. The bout is scheduled for four-rounds. Davenport is also a new addition to the Thompson Boxing roster. A formal announcement will be coming soon. Former Colombian Olympian Cesar Villarraga (1-0, 1 KO) aims to look impressive in his second fight as a Thompson Boxing/Gary Shaw Productions fighter when he meets Osman Rivera (2-5) of Los Angeles in a four-round fight. In his professional debut, Villarraga notched aspectacular fourth round knockout over Sopaun Rin in September.